You are here: Home / Self Help / Appreciation Quote: Yes, You CAN Change Your Life With An Appreciation Quote! Appreciation Quote: Yes, You CAN Change Your Life With An Appreciation Quote! As we were about to mail this Abraham-Hicks appreciation quote to a valued customer, we remembered WHY we created this beautiful work of art. Their most popular book, Ask And It Is Given, includes 22 “games” whose purpose is to raise our vibration and align us with our desires. The first game in the book is called Rampage of Appreciation. It is THE most important game and is guaranteed to transform a life – YOUR life. The amount of transformation depends, of course, on the amount of time spent playing this awesome game. Playing this game makes you feel GREAT and, of course, the better you feel, the most you will want to play. And it is play – do this with a light-hearted, fun spirit. The problem, of course, is that remembering to appreciate all the bounty in our lives isn’t easy. So we use gorgeous appreciation quotes as a reminder. I have a framed quote sitting on my desk and every time I see it, it’s a reminder of all the abundance in my life. #1: Look around right this minute and focus on something that you like. Come on, you can do it. There’s bound to be something. As an example, I have a pumpkin spice candle burning on my desk right now. Just writing these four comments makes me feel good and the longer we dwell on what we like, the better we will feel. 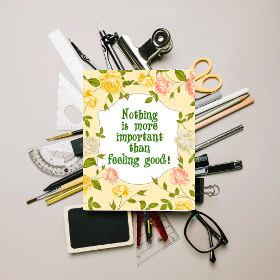 As Esther Hicks says constantly, “Nothing is more important than feeling good”. That abraham-hicks quote (on the right) is my absolute favorite and the one I dwell on the most. #3: Notice how great you feel and appreciate that lovely feeling. Allow that feeling to grow and start looking for something else to appreciate. It sounds too simple doesn’t it? The fact is that we humans go to a lot of trouble to complicate everything. But what if it’s actually easy? 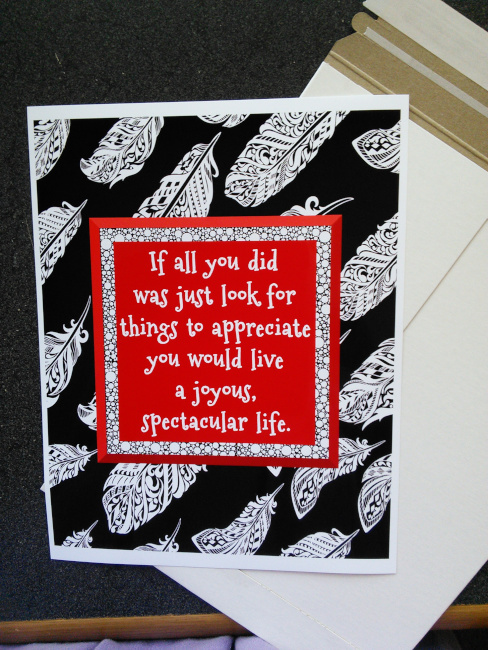 Think about these words: “If all you did was look for things to appreciate you would live a joyous, spectacular life”. Isn’t that what we all want? Don’t we want lives of joy and bliss? Don’t we want spectacular results, whatever that means to each individual? Then why not try a simple experiment and see if this promise actually works? What have you go to lose? At the very least, you will feel better and that’s a pretty important result. But I know what many of you are thinking: this sounds waaaaaaaaaaaay to simplistic! Too easy. WHY should it be this simple? Resistance is what separates us from our dreams – and appreciation is the perfect antidote. Abraham Hicks explains again and again that what is keeping us from our dreams is our resistance. This powerful appreciation quote helps us release that resistance. First, we can’t help but feel good when we notice what is going right in our lives and feeling good is intoxicating. Humans naturally want to feel good and we we will continue doing whatever we can to achieve this and the more we do it, the more we want to do it. This isn’t like a damn diet: forcing ourselves not to eat what we want and forcing ourselves to often eat what we don’t want. This is pleasure, pure and simple. Do you want more pleasure in your life? I know I do. In other words, appreciation becomes addictive. How about that? A HEALTHY addiction. Yee-ha! Secondly, Abraham Hicks talks a lot about our emotional guidance system. That is, our emotions tell us when we are creating what we don’t want. As we practice appreciation we will become more sensitized to this guidance and notice more quickly when we’re feeling awful. That way we can change more quickly. Third, practicing the vibration of appreciation is a haven, if you will. That is, when we’re not feeling great we are often desperate for a way to change our state. We may flounder around looking for some way to feel better – and perhaps we can’t find one. But with appreciation we have an easy way to raise our spirits whenever we want. Wow, that’s a powerful promise, is it not? Let me give an example from my own life about how this appreciation stuff works … Last Saturday I woke up in a rather grumpy mood. “Self”, says I, “time for some appreciation magic”. So I started appreciating the reality that I can get up when I please; I applauded my trusty electric toothbrush that has worked reliably for so many years; I noticed so many features of my bed as I made it up; I appreciated the heat pouring out of the vents. Then my son and I went to breakfast at our favorite fast food restaurant: the food was great; the place has just been rebuilt so it’s new and pretty; they have put up their Christmas decorations and the place was like a fairy land; we’re regulars so were greeted by name by both customers and staff; the seats are comfortable and welcoming. Our fav eating place has a greeter named Mickey, who is a real character. He came to our table and asked a riddle: what is the difference between “unlawful” and “illegal”. He then sauntered away leaving us to ponder this weighty question. Later he provided the answer: unlawful means ‘against the law’ while illegal means a sick bird. After a startled moment we all burst into laughter, agreeing that this reveals the power of assumptions because we immediately thought of “illegal” rather than “ill eagle”. Leaving the restaurant, we appreciated the quiet streets since traffic was light that time of day; we had the sunroof open and glorious cool air poured into our car, making breathing a genuine pleasure; the leaves are turning here in Atlanta and stunning beauty greeted every glance. When I got to my office, I was absolutely glowing with quiet joy and pleasure. And anyone can do this at any time. It’s easy and requires absolutely nothing except a willingness to participate in this delightful game. The Problem With This Rampage of Appreciation Game! To maximize the impact of an idea I have the same quote on all four locations. Also, you know how we tend to grow accustomed to something. At first it stands out and draws our attention – but then we quickly get used to seeing it and don’t notice it any more. So I change my quotes frequently so that I keep noticing them, keeping the current quote fresh and powerful. So, you would like to have this beautiful 8″ x 10″ appreciation quote mailed to your home or office and/or you can download 40 Abraham-Hicks quotes to put on your computer monitor, tablet or smart phone. DON’T pass up this chance to play an appreciation game of your own. Your life will thank you!